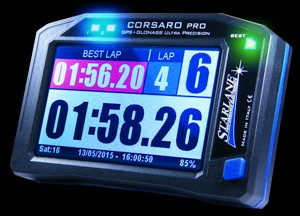 DOUBLE CONSTELLATION GPS + GLONASS LAPTIMER WITH TOUCH SCREEN. THE FIRST FULLY CABLELESS SYSTEM WITH WIRELESS EXPANSION MODULES. CORSARO is the only system of its kind equipped with dual-constellation satellite technology, using symbiotically both the american GPS and the russian GLONASS systems, it leads to a new level of precision for lap timing and for the representation of trajectories in data analysis.